Ethiopia is one of the oldest countries in the world, preserved until now. It is this state that helped to establish Islam by adopting its territory and providing protection to the first Muslims who resettled there because of the oppression of the pagans of Mecca. How is Islam in Ethiopia today? Its story reflected tensions between the institution of imperial power and various power structures, on the one hand, and between the diversity of ethnic, linguistic and regional identities, on the other. This tension, between the tendencies towards centralization and decentralization, has been and remains the main axis of the history of Ethiopia. However, since then science has reached a deeper understanding of the problem, and historians have gained a wider angle of view. He who tries to study the history of Ethiopia only in the aspect of leading Christian culture is content with an incomplete picture. “Islam and Ethiopia,” should deepen and balance our understanding of the problems of Ethiopian history. Islam and its carriers – Muslims played a full and sometimes even decisive role in the history of Ethiopia. Their share in it is constantly increasing. Islam in the Middle East, from the beginning of its appearance in the early medieval era to the present day, was for Ethiopia more than a neighbor, a powerful religion and a great empire, constantly challenging it. In the Middle Ages, Muslims turned into Ethiopia into an internal factor, part of the country’s life. 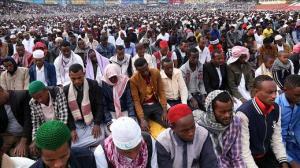 Since the beginning of the New Age, the number of Muslims in Ethiopia has steadily increased, and at the beginning of the 20th century, it was equal to the number of Christians. For many generations, the Muslim communities of Ethiopia did not seek to shake the hegemony of Christianity as the state religion and the basis of the official culture of the country, but they achieved great success in the struggle for their own survival in the Christian environment, for incorporating into important areas of Ethiopian life and made an invaluable contribution to the economic development of the country. Islam in Ethiopia seems to have reached unprecedented prosperity and perhaps even rises for the first time to a level that allows it to compete with the claim of Christianity to be exceptional as a culture of the Ethiopian elite. The Ethiopian Muslim historian of our time, Professor Hussein Ahmed, responded to the above statement. In any case, for centuries, the history of Ethiopian Islam revolved around the axis of dialogue between an organized state and the dominant culture and diversity of communities representing Ethiopian minorities. Christianity, beginning with its first steps in antiquity and until the revolution of 1974, consistently realized itself as a religion of the state imperial order, a religion representing a culture based on the ownership of land, agricultural and military spheres. Islam was adopted in the Horn of Africa by those who wanted, as far as possible, not to be absorbed by a system based on the aforementioned values, and to take them as the basis of their existence. By accepting Islam in this corner of the world, various tribes, representatives of certain language groups, nomads, traders, shepherds, certain ethnic groups, etc. The members of these groups or their part defined themselves as Muslims in order to consolidate their own identity, and sometimes even build their own political structures based on the value system of Islam. As a result, Islamic communities were separated not only from Christian culture but also from each other.